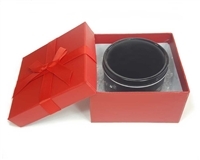 This is our SMALL sized gift box and tin suitable for our Bracelets with Sterling Silver and braid as opposed to our Cuffs and Wristbands. 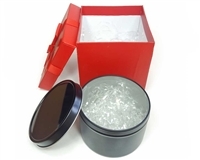 For Cuffs and Wristbands choose the Medium or Large Size Box and Tin. The Small size box is 3 1/2" x 3 1/2" and the depth is 2 1/4". The depth of the Small tin is 1 1/8".